Protestors made their presence felt when the Fine Gael Minister for Health Simon Harris turned up in the North West today. 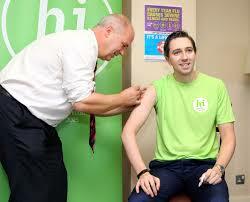 Harris had travelled to launch health facilities in Boyle and Ballymote. However, protesters in both locations immediately challenged him over the controversial Gardasil HPV vaccine as well as Government plans for the legalisation of abortion facilities. The roll-out of abortion will see the killing of babies up to 12 weeks in a pregnancy, and, in some cases 24 weeks on. Harris, however, reportedly called on people to respect the outcome of the recent abortion referendum, adding that he intended to get on with his job of enacting the abortion legislation. Responding to concerns about the Gardasil vaccine, he said its use was necessary for reducing the rates of cervical cancer. HPV vaccination of young girls, and, soon young boys was important, he said. He also spoke about the need for a robust screening programme. Protestors opposed the use of the vaccine claimed that it had already injured the health of many young girls.